Remembering The 'Freedom Riders,' 50 Years Later Fifty years ago, seven black people boarded buses with six white people in Washington, D.C., and took the fight for civil rights to the Deep South. Their trip became known as the Freedom Rides, and a new documentary by Stanley Nelson talks with the people who witnessed the rides firsthand. 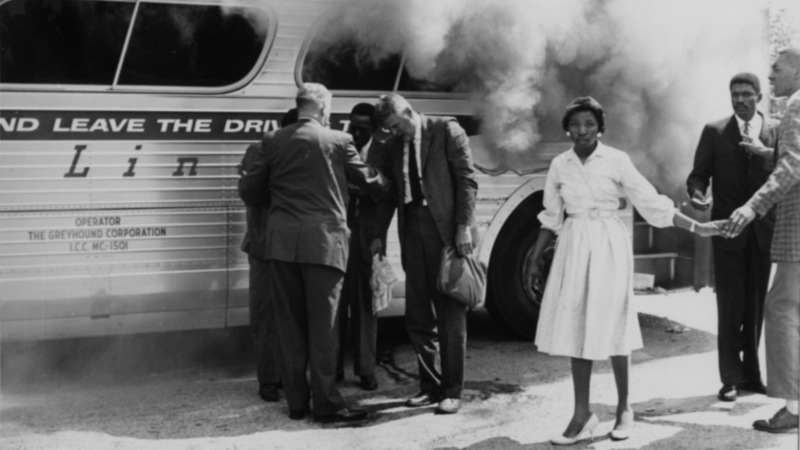 Freedom Rider Mae Frances Moultrie Howard stands by a burning Greyhound bus in Anniston, Ala. on May 14, 1961. Fifty years ago, seven black people boarded buses with six white people in Washington, D.C., and took the fight for civil rights to the Deep South. Their trip became known as the Freedom Rides. 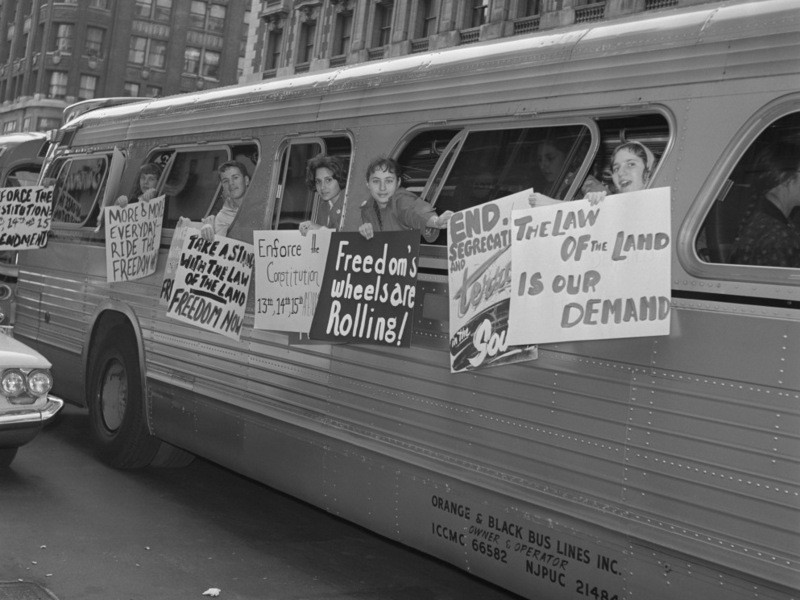 In Freedom Riders, a new documentary that airs this month on PBS, filmmaker Stanley Nelson talks with the people who witnessed the rides, which were organized by the Congress of Racial Equality. "The first group of Freedom Riders didn't really know what to expect," Nelson tells NPR's Neal Conan. They encountered angry mobs in the Jim Crow South but remained steadfast in their commitment to nonviolence. Members of the Washington Freedom Riders Committee prepare to leave New York for Washington, D.C., on May 30, 1961. In Birmingham, for example, Alabama politician Eugene "Bull" Connor ordered police to stay away from the bus station, giving the assembled mob 15 minutes to do whatever they wanted to arriving Freedom Riders. According to Nelson, one witness recalled Connor telling the mob, "I don't give a goddamn if you kill them. You got 15 minutes and nobody's going to get arrested." Prior to the rides, the Supreme Court had twice outlawed segregation in interstate commerce, which applied to interstate bus travel, yet Southern bus stations and buses remained segregated. Ernest "Ripp" Patton took part in the May 24, 1961, Greyhound Freedom Ride from Nashville, Tenn. to Jackson, Miss. Because it was one of the later Freedom Rides, Patton tells Neal Conan, he had a better idea of what he was getting into. By the time he boarded the bus, Patton says, "They had had the mob attacks in Anniston, Birmingham and Montgomery." But he still went to Nashville and from there to Jackson, where he was ultimately put in jail. According to Patton, Freedom Riders opted for jail time over fines. "The fine might be a $50 fine and the sentence might be 31 days, but we would choose the 31 days," he explains. "It makes it hard on the system to have to feed and take care of a lot of students that they really didn't expect to do that with." Patton, who served some of his time at Mississippi's Parchman State Prison Farm, says it was a technique they learned from Gandhi. "I think I remember one time listening and they said, 'What are you going to do this summer?' " Patton says. " 'Well, I can flip burgers or I can go to Parchman.' "